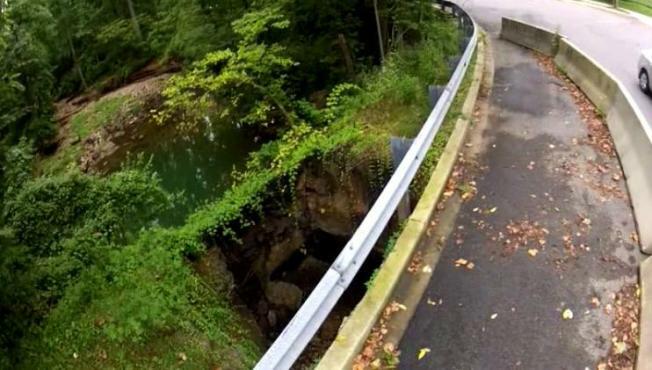 Many of the 16,000 daily vehicles that cross over the Kalmia Road Culvert between East and West Beach Drive in Rock Creek Park have no idea what lies just beyond the road. Part of the structure collapsed more than three years ago, washed away by heavy rains and melting snow. Now News4 has learned the D.C. Department of Transportation is ready to fix the problem. The District is close to awarding a $1.6 million contract to build a new bridge where the current washed out culvert exists. Work is expected to start in the next few weeks. The culvert has to be closed for over three months to complete the project. "The new design has been completed and the project is now in the procurement process," says DDOT Spokesperson Reggie Sanders. A culvert is a structure that allows water to flow under a road -- but this culvert is outdated, and it's not just cars that use this road -- bicyclists and pedestrians also ride along. "In addition to replacing the culvert, a new 12-inch waterline will be installed replacing the existing old line and wider sidewalk," Sanders said. Jerome Netter, whose house overlooks the culvert is happy to hear that it will be getting a facelift. He has three young children who also use the structure. "It looks pretty scary," Netter said. "If and when the bridge will be closed, it will be a nuisance, but I guess we don't have an alternative."